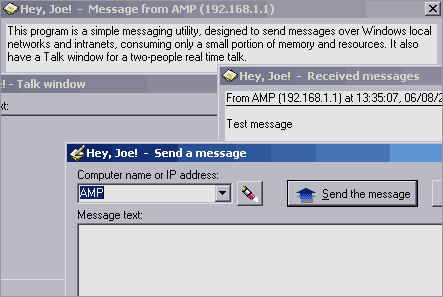 Send messages on local intranet network, Hey Joe! If you work on computer connected to local intranet network then Hey Joe utility can make conversation like breeze. This utility allows you to send messages over local networks and intranet. There are number of basic features like auto responders for incoming messages, session logging and message alerts. It allows you perform messenger window style chatting with friends on the local intranet network. Interface is dead simple and this small utility allows you to chat without causing strain on system resources. Grab Hey Joe to stay connected with friends on local network / intranet.